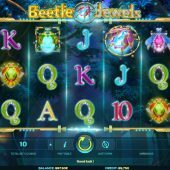 Beetle Jewels slot is a fast-play 10-liner with a nocturnal forest theme and undertones of a magical night; indeed under the transparent reels you are treated to a nice image of the moonlit woods and and the mythical creatures within. The reels spin with a gentle musical tone and any wins created a tinkling noise when they land. Will any surprises emerge from the darkness though? If you land 3 or more Neon Beetle scatters anywhere in view, you are awarded 10 free games, which can be retriggered during the feature. The screen will then display a rotating view of all symbols except the scatter/Wild and stop on one symbol for each of the free games. If it is a picture symbol and appears twice or more, it will expand and pay across all 10 lines. Three or more card symbols has the same effect. Effectively you are getting a 10x multiplier on any scatter wins. If you get awarded the 'J' in the top window which pays 10x stake for 5, then if it lands on all 5 reels you get a full screen and thus 10x 10x bet wins. 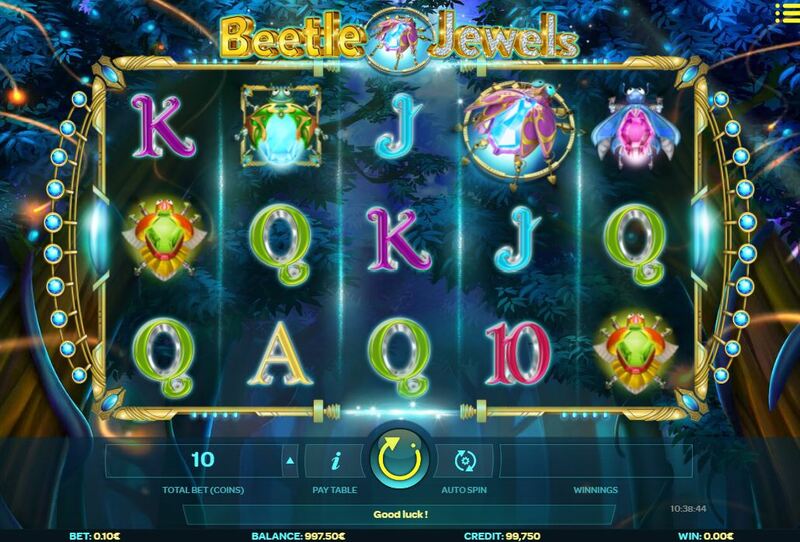 The jackpot is obviously getting the Neon beetle as your chosen symbol for that spin, and one landing on all 5 reels for a colossal 10x 500x bet win, 5000x stake!